Join Lizard Head Cycling Guides for a brief but fun-packed 4-day/3-night ride across Utah. 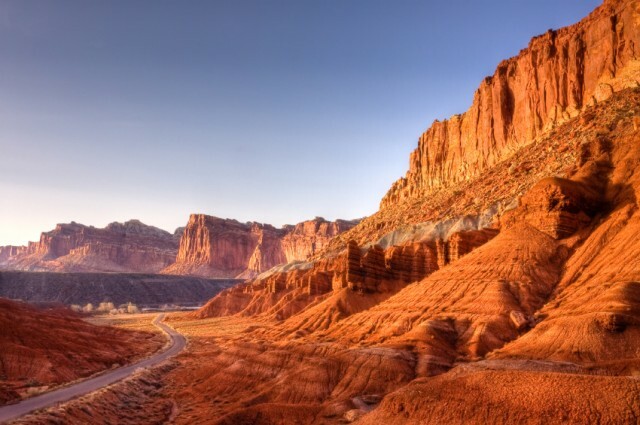 Pedal across this ruggedly beautiful land on car-free roads showcasing the best-kept secrets Beehive State on our new Utah Hike and Bike Tour! Discover the remote Fish Lake Mountains. 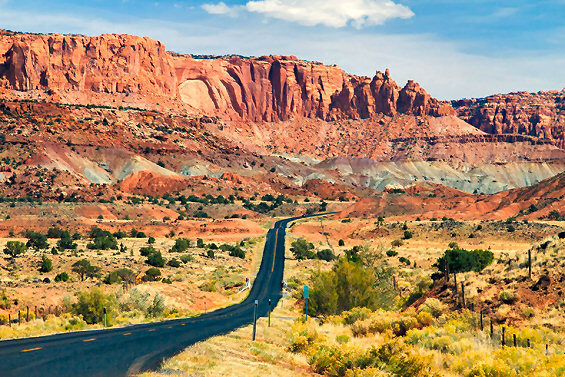 Spin through the seldom visited Capitol Reef National Park and Grand Staircase Escalante National Monument. 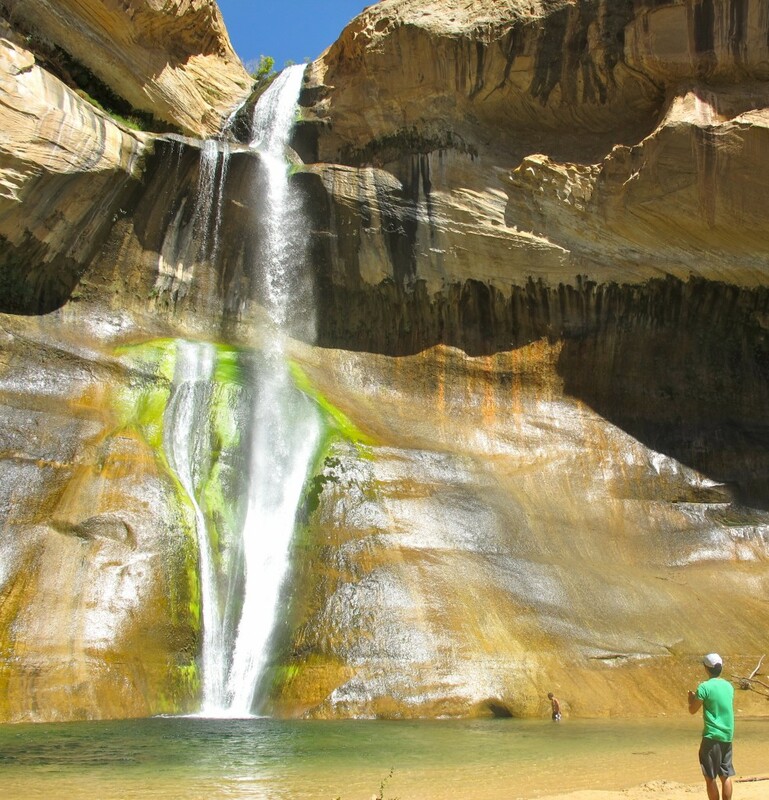 You’ll also take a thrilling hike to Calf Creek’s 126-high desert waterfall. Finally, ride the remarkable Waterpocket Fold & Burr Trail. Also: all meals, taxes, entrance fees, daily lunch en route, energy food, liquid refreshments, shuttles, guide service, sag support, a nice cycling jersey and mechanical support. Read a New York Times Story about what bike touring with Lizard Head Cycling Guides is all about. We’ll start the Utah Hike and Bike Tour at Capitol Reef. This isn’t your typical tourist and traffic-clogged National Park. Gaining its status in 1971, it’s still relatively unknown to most visitors. You’ll appreciate navigating car-free roads and hiking in the incredible desert landscape and the hidden scenic treasures along the way. The adjacent Grand Staircase Escalante National Monument adds more wonder to the already amazing cycling you’ve experienced in the this short but sweet trek. This is a great trip to bring along a non-riding spouse or to design as a custom tour for your group. Plus, we’ll take you to some of our very favorite places to eat and relax! Expect slightly toasty temperatures in the mid-80’s throughout the daytime hours in June. But because this is the high desert, you’ll also need to bring along some light outerwear, as the lows dip into the mid-50’s. Utah’s southern region is one of the most remote and least visited areas of the country. The seemingly inhospitable terrain conceals some very rewarding scenery for those choosing to visit. We know this territory well, and we’ll reveal those secrets to you! Daily mileage options allow cyclists of varying abilities to enjoy this tour. One of our favorite options is to give cyclists a “bump” via the support vehicle, or a 10 to 20 mile lift down the road representing an hour of pedal time. only exist as relative terms to other people. Speed does not matter as long as you are moving on the bike. See How the Shuttle works below Day 4’s description in Tour Logistics and FAQ. On Day 1 cyclists ride up into the remote Fish Lake Mountains of central Utah. Tonight’s lodging at the Red River Ranch is a night to savor. 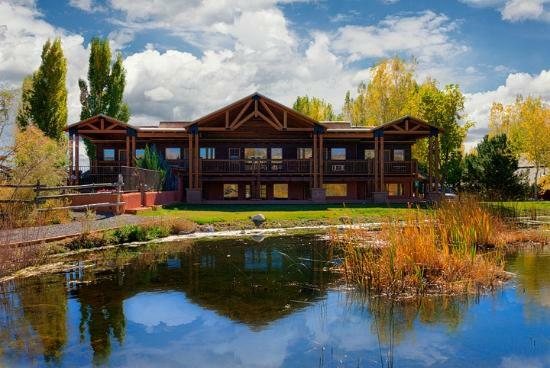 The Red River Lodge recalls the great old lodges of National Parks system. 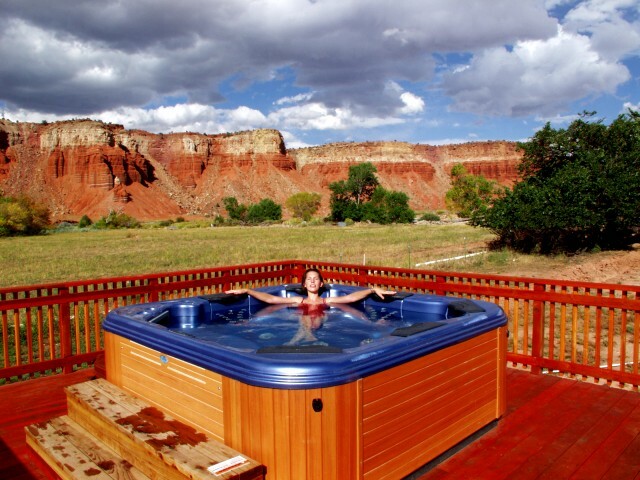 From your lodging at the Red River Ranch, pedal 14-miles beneath redrock walls to the Capitol Reef National Park’s Visitor Center. 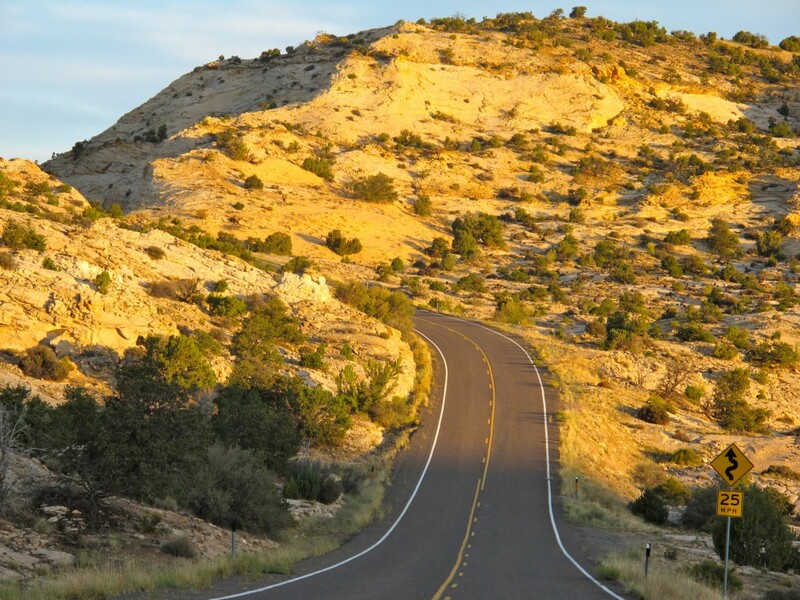 Next, spin along Capitol Reef’s Scenic Road on a 9-mile out and back (18-miles roundtrip). Don’t miss the petroglyphs located just east of the visitor center If it’s in season, pick some park service peaches and apples along Highway 24. Fresh pies are available for purchase at the Gifford Homestead (one mile east from the Visitor Center). After visiting the park, you’ll climb nearly 4,000-feet along the Utah Highway 12’s Journey thru Time Scenic By-Wayto the top of Boulder Mountain at 9,000-feet. Tonight’s lodging is the wonderful Boulder Mountain Lodge. Your dinner and breakfast for the next two nights are at Lizard Head Cycling’s favorite restaurant, Hell’s Backbone Grill. 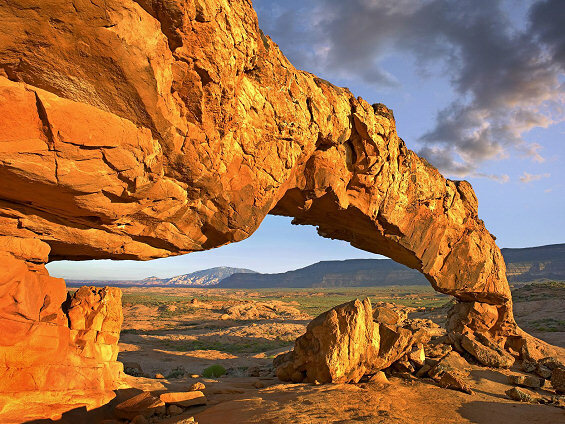 Explore the desert high country of the Grand Staircase-Escalante National Monument that surrounds Boulder, Utah. After breakfast, ride 24 miles west on Highway 12 to Calf Creek Falls. Then it’s on to a truly spectacular 3-mile out and back hike. At trail’s end, a 126-foot tall desert waterfall greets hikers like an oasis. Take a refreshing and well-deserved swim in its cool waters. You decide if you’d like to ride the 12 miles back to the lodge…or ride on a return shuttle. After returning to the Lodge there is the option of afternoon yoga beneath the giant cottonwood trees of the Boulder Mountain Lodge. Dinner tonight is again at the Hell’s Backbone Grill. 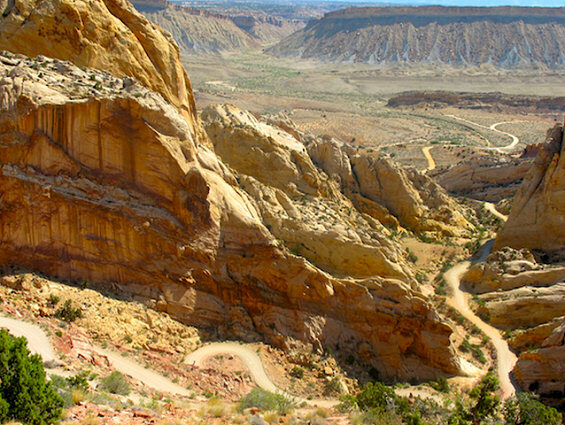 On Day 4, you’ll ride along the Burr Trail to the geological oddity of Waterpocket Fold in Capitol Reef National Park. Allow yourself to frolic in a slot canyon and hike to the remote Double Arch, deep in the Waterpocket Fold. Later on, we’ll shuttle back to Grand Junction. A stop at Goblin Valley State Park may be in order during the return shuttle, along with a farewell meal at Ray’s Cowboy Bar in Green River. This tour is designed for intermediate cyclists with various levels of fitness. Each day there are additional mileage options for advanced riders. A van and trailer that carries luggage, food and equipment supports Lizard Head Cycling’s tours. Cyclists keep a day bag that is accessible within the support vehicle.